As the only five-star accommodation in northern Tenerife, this delightfully secluded option is just minutes away from the picturesque old town of Puerto de la Cruz and its accompanying beach. Then, back at base, subtropical gardens fringe marble-accented rooms, five restaurants and one of the best spas in Europe. It even has the islands’ largest collection of 19th- and 20th-century artwork and sculptures, exhibited in the lobby. As the Canary Islands’ first five-star accommodation, the Hotel Botanico has something of a track record when it comes to luxury. And, this is perhaps best felt in the rooms, each featuring marbled bathrooms, pillow menus and private balconies that overlook the hotel’s gorgeous subtropical gardens. Perhaps upgrade to an antique-furnished suite for the likes of sea views taken in by private penthouse Jacuzzis. They’re named after the famous guests that have stayed in them, from Michael Jackson to Bill Clinton. The superb service continues in the restaurants. You might want to enjoy a casual bite under the palm trees, or indulge with one of the Canaries’ best Italian restaurants, where fine wines are paired with show-kitchen pasta. The pan-Asian cuisine of the Oriental Restaurant is a further highlight, having been opened by the Queen of Thailand herself. However, for many, it’s the irresistible steaks and just-caught seafood the La Parrilla that steal the show. Whatever you choose, be sure to end the day with nightcap in the Hall Bar, enjoying the live music and views over the gardens. Indeed, it’s all wrapped in 25,000m2 of greenery. Giving the hotel its name, they were built by King Carlos III in 1788, featuring everything from Japanese koi ponds and wooden bridges to vibrant flowers and intimate nooks to hide away in. It’s all inspiration for the superb spa, whose treatments are considered among the finest in Europe. The hotel is also child friendly, with the option of booking your little ones onto a kids' programme, while adults might be more interested in the yoga and aerobics classes. There’s also a spread of complimentary services. Along with the shuttle to nearby Puerto de la Cruz, guests have access to everything from the modern gym, billiards table and tennis courts to the practice green and driving range. For more golfing, simply look to the nearby courses on the hotel’s preferential rates. Of course, there’s plenty of opportunity of hiking, horse-riding and scuba diving in the surrounding area. 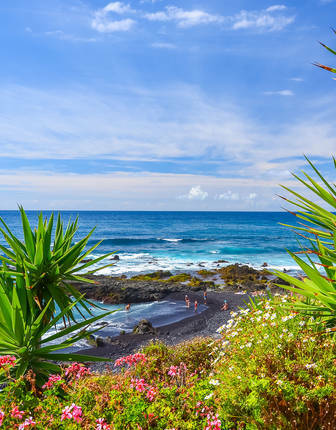 Staying in one of the Canary Islands’ most luxurious properties, you’ll uncover the vineyards, beaches and quaint fishing towns of Tenerife’s north with private tours and transfers included throughout.